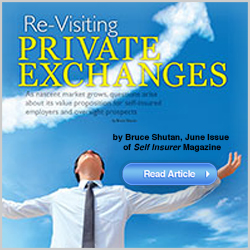 In the June issue of Self Insurer magazine, Brooks Goodison, President of Diversified Group, was asked to weigh in on the recent buzz surrounding private exchanges. His observations provide an opposing viewpoint and insight from a third party administrator (TPA) dedicated to helping client groups identify and attack the real causes of spiraling health care costs. “It seems like there’s an awful lot of buzz on something that isn’t particularly new,” observes Brooks Goodison, president and principal partner at Diversified Group Brokerage, a TPA whose client base averages 100 to 250 covered lives. His critique – There’s no need to reinvent the wheel on a vibrant private marketplace that has already been around for years, while the push for greater freedom of choice through more Web-based options simply recycles an old idea (i.e. Section 125 cafeteria or flexible benefit plans). Goodison’s biggest bone of contention is that private exchanges do not reduce runaway health care costs or the root of that problem in any substantive way. All it does is adjust “what the employer is going to pay and cost-shift it on unsuspecting plan members,” he says. He also sees a “moral hazard” associated with most people purchasing standardized, metal-plated benefit packages featuring high out-of-pocket maximums in an online marketplace that places decision support tools over human contact.